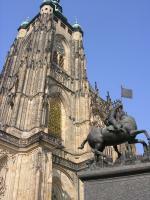 The Historic Centre of Prague played a prominent role in medieval Central Europe. It has seen continuous urban development from the Middle Ages to the present, resulting in an architectural ensemble of outstanding quality. Last year's experiences with Florence made me a bit wary to visit Prague in late spring / early summer. Since the fall of communism it has become such a popular tourist destination that I was afraid to be among crowds. And, unfortunately, I was right. Streams of people pushed themselves through the old center and over the Charles Bridge. The first kilometer from the central train station into town reminded me of the Nieuwendijk, that particularly ugly part of Amsterdam (with fast food stalls, exchange counters, souvenir shops and overpriced terraces). Isn't there something nice to say? Why should anybody want to go there? A good thing to do is to walk into a paralel street next to the main routes, and gaze at the elaborate facades of the houses and public buildings. When you visit Prague you have to distinguish between the new area and the old area, both very nice. In the old area you can appreciate the old palaces and medieval buildings, but not only. Nearby there is also the Charles Bridge, the symbol of the city. 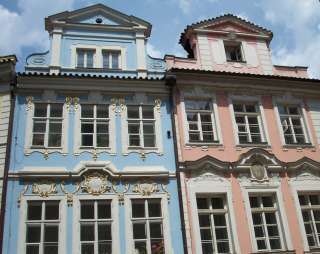 In the north of the old town you can visit the Jewish Quarter. All this is of great architectural and cultural interest. I visited this WHS in May 2012. The city of Prague is one of the most beautiful cities of Europe. The Chain Bridge and Mala Strana District at sunrise were the highlights of my visit in Prague. Great panoramic views of the city can be enjoyed from the Metronome Park or Castle Hill Vineyards. I have visited many countries across Europe (have been 7 times there)and no other place can be compared to Prague. I still remember the magic and wonderful athmosphere when I first visited it, I felt in a fairy tale. Of what I know, I still can say that Prague is the most magical and beautiful city I have seen so far in my life. Only Mont St Michel in northern France gave me a similar magical feel and a sense of wonderful place. I still have to go to Kracow to see if it is as good as everybody say. Praha, Prague, Prag - the Golden City. Unfortunately I only spend one day there during my trip to Czech Republic in August 2005, but it was great! It's amazing how many tourists stay on Carl's Bridge at the same time. The whole city has so much to see, so many interesting churches, the castle, the Jewish Cemetery and facades of so many perfectly restaurated houses. Fantastic!! Is Prague a heavily touristed town? Without a doubt. It draws people from around the world, and, with the expansion of cheap European airlines, the crowds are only going to get bigger. Is Prague a town that in spite of its drawbacks still deserves an extended visit? Absolutely! While I often complain about the sheer number of tourists that descend on towns like Florence and Prague, one has to admit that they have it right. 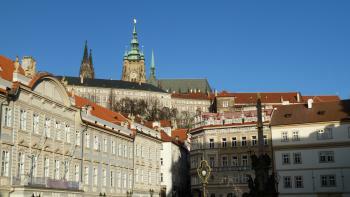 Prague is a scintillating experience, worthy of visit even at the most popular times of the year. Go for the spectacle, go for the fairy tale setting, go for the beer, it's all there to be enjoyed in Bohemia's capital. I particularly enjoyed walking around the Josefov district and the Old Town Square, gazing upon the truly beautiful Tyn Church that rises above the houses. Just a wonderful city. Another vote in favor of Prague from me. It's true, the city can get enormously crowded at any time of the year and day, but this is true for other cities as well and people seem to criticize only Prague for it. So if you want a quiet city just for yourself without the crowds, this is not the place for you to go. But for those who don't mind a few other tourists, Prague remains one of the most beautiful cities in Europe. The Hradcin with the Cathedral is really a great sight from the city below, and the old town and Charles Bridge are must-see sights as well. A daytrip to any of the older Czech cities or the many castles around Prague will help you get away from the crowds at least a little bit. First things first; Prague has a lot of tourists! However its massive charm is more than enough to make this one of Europe's most impressive destinations. Prague is one of the most beautiful cities in the world. I can not think of a setting I have seen that can beat the combination of Vltava Charles Bridge, Mala Strana and Prasky Hrad (Castle). The beer is the best in the world and competes to be the cheapest (and I would like to point out this is not just in terms of Western Europe this is still the cheapest quality beer I have come across!) This would be enough for me but Prague throws more at you. Staromestka namesti (Old Town Square) is taken directly from a fairy tale, Joefov is one of the oldest Jewish settlements in Europe, Vaclavsky Namesti (Wenceslas Square) is dripping with contemporary history. On top of this you have one of the densest clusters of Art Nouveau art anywhere in Europe; with Obcedni Dum ranking amongst the very elite of this style in architectural terms. Then there are the outlying parts such as Vysehrad to add to this. All is then mixed with an artistic heritage which even by Central European terms is amazing. And it is only once you see all this you can appreciate why you will no longer have Prague to yourself. It may have changed a lot since 1989 but this is still a city that should feature highly on any traveller's itinerary. The best advice I can give is just to go off and explore (the same with every touristy city). The main drag between Staromestka Namesti and the castle is very impressive however this is the focus of the crowds. Delving into side streets to find hidden gems like Valdstejnska zahrada (Wallenstein Garden) exploring the bars and clubs of Nove Mesto will help you see that there is more to Prague than shops selling communist nostalgia to Western drinking parties. Prague is an astonishing city and the small amount of effort required to lose the crowds is all that is needed to find a highlight of Europe. There can be no doubt that Prague is a beautiful city, but, sadly, it has sold its soul to tourism. The old city is enormous and generally in original condition, the lack of war damage is remarkable. The downside is the high cost, compared to the rest of the Czech Republic, the unfriendliness of the populous and the tourist traps. I was disappointed by Prague. Filled with tourists and badly organized traffic, it was chaotic and unpleasant. To avoid the atmosphere, it's better to buy a book of the architectural wonders of the city. Also the food was similar to elsewhere in eastern block, grease and mayonnaise ruled all over. 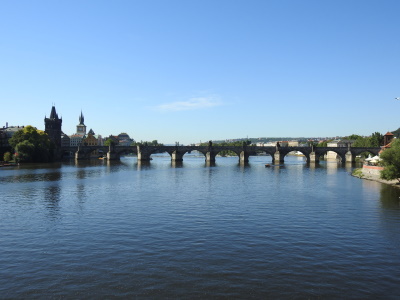 I only recall one nice even, getting off the metro in Vysehrad, and walking over the bridge to the center. That fifteen minute walk over the valley beyond was beautiful. Some people say Prague is the most beautiful city in Europe. While we might not go that far, it’s difficult to find a “one-view” that would surpass the sight of the Vltava River and Karluv Most (the Charles Bridge, a pedestrian bridge adorned with 75 statues and statue groups), with the Prague Castle and St. Vitus Cathedral high above Marla Strana (Lesser town). Yes, in summer Prague is pretty crowded, not so charming. Walk in Zlata Ulicka was terrible. Once I visited Prague at the end of February - no tourists, but not so pleasant weather as well. What I liked in this city? Its huge historical centre. We in Baltics have used to rather small Old Cities, but here it takes looong time to go through it - the buildings and sights are very interesting. I consider that Czechs keep their capital very well - they also have sense of taste, what is not the case with many modern Western European cityplanners and architects. Palladio and Palladian style: Černín Palace - "decorated with thirty Palladian half-columns"
Modern Urban Planning: The city is rich in outstanding monuments from all periods of its history. Of particular importance are .... the late 19th century buildings and town plan of the Nave Mĕsto. 'Threatened' by Skyscrapers: Pankrac district (3kms from centre)/"City Tower"/104 mtrs/27 stories above ground/completed 2008 having been converted from a dormant abandoned Communist-era construction site, to a fully functioning office building - but others are in construction or planned close by eg Ledová věž (Ice Tower) and are opposed by UNESCO as being too high. 'Threatened' by Tunnels: "The Blanka tunnel, which is to form part of a planned ring road around the city, runs only a few hundred metres from the protected area of Prague Castle." Assassinations: (Saint) John of Nepomuk was thrown into the river from Charles Bridge (1393). Plus First Defenestration (1419), resulting in the death of several people including the Mayor. Plus: Cernin Palace - the Czech Foreign Ministry. 10 Mar 1948 Jan Masaryk (the only non communist in the Soviet installed government) was found dead in the courtyard under the bathroom window. At the time it was claimed to be a "suicide". Subsequent investigations have been unclear but the probability is assassination. Famous suicides: Jan Palach, student who committed suicide by self-immolation as a political protest. Insurrections: The Velvet Revolution in the Venceslas Place and other area of the Historic Centre of Prague, in novembre and decembre 1989. Liechtenstein Family: Lichtenstein Palace (Lichtenstejnsky palac, sometimes also called Ledebursky) was the first large Baroque building in Prague. It was built at the beginning of the 16th century by Karel of Lichtenstein, whose descendants own the Principality of Liechtenstein in Central Europe. Hitler was here: "In the late afternoon (of March 15 1939) Hitler himself arrived in the Czech capital to sleep in the Hradschin Castle, seat of the Bohemian kings, the Habsburgs and of the Czech democracy". On March 16 "...speaking from the balcony of the castle, Hitler proclaimed to a shocked and sullen populace that their country no longer existed. It had been replaced by the Protectorate of Bohemia and Moravia". Servite Order: On Charles Bridge: Statue of St. Philip Benitius. He was the general of the Servite order and is the only marble statue on the bridge. He's portrayed with a cross, a twig, and a book. The papal tiara lying at his feet is a symbol of the saint's refusal of the papal see in 1268. Opera: "The Adventures of Mr Brouček" (1920) by Leos Janacek from the books by Svatopluk Čech. "Excursion to the Moon" commences "On a moonlit night in 1888, Mr. Brouček stumbles down Vikarka street after a drinking binge at the Hradčany tavern (Vikarka Inn").....". 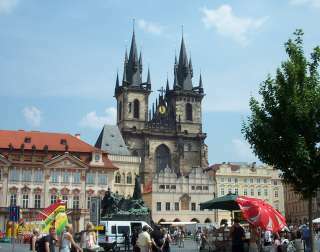 "Excursion to the 15th century" is also set in Staroměstské náměstí (Old town sq). There is today an inn in Vikarka St called "Vikarka Inn" which possesses "a Mr Brouček's Cellar" and "the oldest Romanesque wall at the Prague Castle" but whether that is the inn used by Čech and Janacek isn't totally clear! 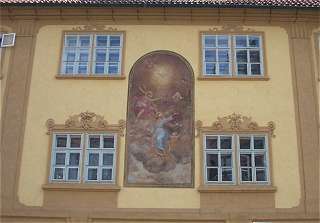 European Route of Historic Theatres: Emperor Route: the Estates Theatre (1783/1859) represents 200 years of Czech and German theatre history in Bohemia. The world premiere of Mozart's opera Don Giovanni took place here in 1787. 668 Community Members have visited.